Trail riding at the lake in the Summer is great fun. 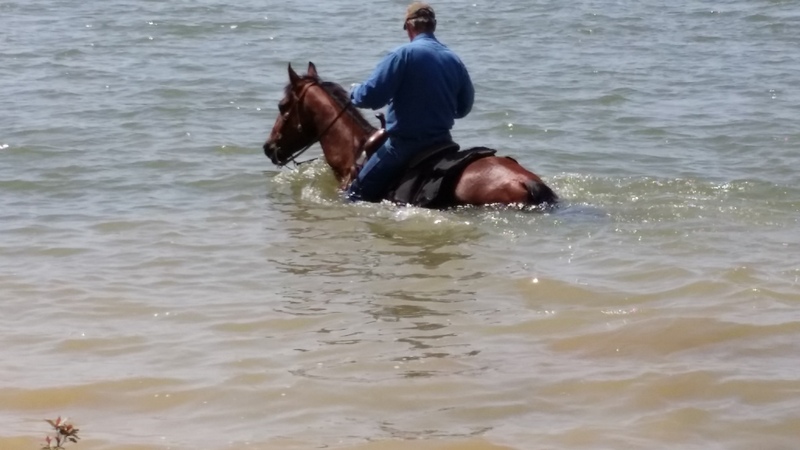 The horses loved the water and enjoyed the opportunity to cool off in it. We like to get the horses used to water and ready to go where ever might be needed. Earlier in the day we rode through some areas of the trail covered by water and lots of mud. But, that’s trail riding in Oklahoma, you just never know what to expect. Usually the trails are pretty dry this time of year, but a storm a few days before brought some much-needed rain. It’s also typically really hot in July, but the past weekend was a pleasant 90 degrees Farenheit that made for a wonderful day at the lake. The horses in the video are Doc and P.J. The mule is Tia. She belongs to a fellow trail rider and friend. Rider confidence is far easier to develop when riding a well-broke, seasoned horse. Novices have a really hard time gaining confidence astride a problem horse. Instead of learning good techniques and skills, they spend their time trying to prevent the horse from getting away from them. 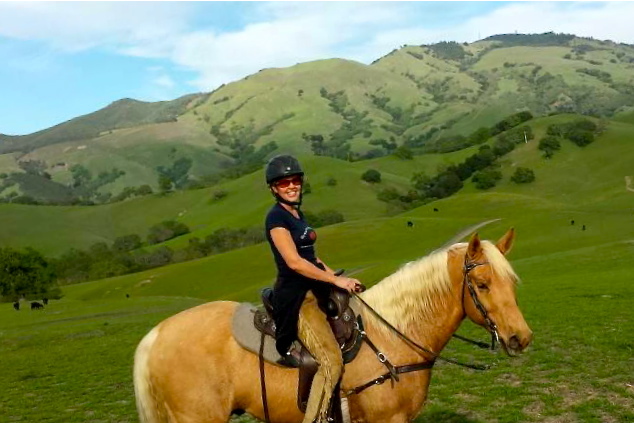 There isn’t time to gain balance, coordination, and confidence in the saddle. The entire time is spent trying to maintain limited control of the horse. It’s no surprise many novice riders quickly give up if the only horse available is a problem one. It just isn’t worth the worry and the trouble to keep riding. We have decided to assist with the dilemma by conducting a rider confidence clinic where riders struggling to gain confidence can attend and ride a horse without issues. Participants will learn to tackle both natural trail obstacles as well as man-made barriers similar to those encountered by competitors in a trail challenge. Participants will see an increase in their riding ability and their overall confidence. The hands-on experience with coaching from a professional horse trainer will provide proper techniques and instruction. Using our trained trail horses will let the riders focus on the areas that need work and assistance without worrying about the horse. One reason we use quarter horses is their naturally calm disposition and willing nature. When properly trained, a sound quarter horse makes the perfect teacher for new riders or those needing to build their confidence. The best part about an AQHA horse is its versatility to be used by a brand new rider or compete with seasoned professionals in top-level competition. It is truly a remarkable breed. The class will be limited to 4 to 6 attendees and last approximately 3 -4 hours. There will be a question and answer session to ask questions with others sharing the same experience and skill level. The class will demonstrate the proper way to engage in horse back riding in a safe and enjoyable setting. The class will end with a trail ride and lunch. More information and details will be posted in the near future. We had a great ride today and the horses are all doing well. Just like any job, there are ups and downs over the course of a month. Those days like today make it all worthwhile. It was a beautiful day in Oklahoma with enough wind to keep an otherwise hot day pleasant. The horses were all given a ride and one colt worked all day. A day in the saddle is therapeutic physically and mentally. You hit the shower tired, but happy. Riding a horse clears your mind of all the junk that builds up over the week. Many people report regular riding actually increases their everyday job performance because the come to work rejuvenated and relaxed. Memorial Day Weekend is typically a great time to ride in Oklahoma. The weather is warm and the landscape is green. The sunshine, fresh air, and rocking chair horse ride watching the beautiful scenery as you go by is an excellent way to spend the holiday. You can’t beat it!